We recently reached out to numerous partners and customers to better understand how they were introduced to ESGI and the impact it's had in their classrooms and districts. One of our first responses was submitted by the Krouch Early Childhood Center in Tecumseh Public Schools from Oklahoma. The Krouch Early Childhood Center is comprised of 7 Pre-K classes, 8 Kindergarten classes and one Special Needs class and has an enrollment of approximately 300 students. Their principal, Tammy Giaudrone, first heard of ESGI from a few teachers who came to her school from districts using ESGI. 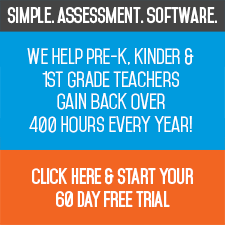 She says, "It saves time for teachers! It also helps the uniformity in our school. The reports for parents are simple and easy to understand." Here is what the teachers have to say about ESGI! ESGI made giving assessments very quick! The students loved being tested on the computer!! I loved how quick and easy it was to assess my students. It did not take away from my teaching time as other assessments I have used. I love how the report is easy to read and can be broken down into a pie graph representation for parents to easily understand. I love ESGI! It is so simple and easy to use. I also love that you can create tests to go along with your specific curriculum, and you can make the tests developmentally appropriate for four year olds. My sister Misty said she thought it was very easy to understand and she loved how it broke it up into sections so she could easily see if there was anything Tanna need extra help with. I love that you can create your own test that works for your grade level. I love that it is so easy to show parents and explain what their student needs help with. I have enjoyed using ESGI this past year in my classroom. The students seemed more eager to complete testing on the computer rather than on paper. Here are a few reasons as to why ESGI is so beneficial in my classroom. ESGI isn’t just for testing. I used it to print out flash cards and name tags for my students. ESGI is very time efficient and keeps track of all testing throughout the year. ESGI allows for each teacher to create tests that meet the needs of their students. Creating tests on ESGI was very user friendly. My students always ask "when will it be my turn? ", they also love the instant feedback the system provides. Try ESGI FREE for 60 days and reclaim YOUR 400 hours per year!